As a representative of the Trilobita, we present the well-known trilobite Elrathia kingi, from the Middle Cambrian of Utah, near the town of Delta. On the left is a normal specimen; the picture on the right is in reversed black and white, which makes it easier to see the features. Trilobites ("three lobes") are so called because their bodies are divided into a central axial lobe in the middle and two pleural lobes on the sides. The head, or cephalon, is typically crescent-shaped and often bears two compond eyes (although some trilobites were blind). The swelling in the middle of the cephalon is the glabella; to the sides are the eyes and the facial sutures, which separate the free cheeks, or librigenae, from the rest of the cephalon. The free cheeks have been slightly detached on this specimen. The pleural lobes are made up of overlapping pleurae, which covered the delicate legs. Trilobite legs were biramous, bearing both walking branches and feathery gills; food was passed forward to the mouth by the expanded basal segments of the legs, called gnathobases. At the posterior of the body, the pleurae were fused into a flattened tail-like segment, or pygidium. 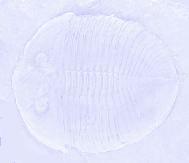 In some trilobites the pygidium is quite small; in others it is large and ornamented with spines.